First make the eclairs. Preheat your oven to 200 degrees. Put the butter in a saucepan with the water and salt and melt on a low heat. When all the butter has completely melted, bring the mixture to the boil quickly and add all of the flour. Remove the pan from the heat and beat with a wooden spoon. Once the dough has come together, place the pan back on a low heat for a minute, still beating, to cook the dough a little. Then put the dough in a large mixing bowl and leave it to cool for about five minutes. Beat the eggs in a small bowl, then gradually add them to the dough, bit by bit, beating well after each addition. Spoon the dough into a piping bag fitted with a plain nozzle and pipe 10 cm lengths onto an oiled baking tray. Bake for 15 minutes, then turn the oven down to 170 and bake for another ten minutes. Remove the tray from the oven and make a small hole in the side of each eclair, to allow the steam to escape. I used a cake tester to do this, which made a very small hole. Put the eclairs back in the oven for another five minutes. Remove from the oven, leave to cool, then cut each eclair open along one side and pipe in the cream. 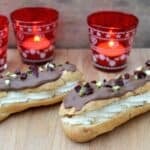 Dip the top of each eclair in the melted chocolate and smooth it over with a spoon. Chop the cranberries and pistachios into small pieces. Decorate the top of each eclair with the chopped cranberries and pistachios.